The Children's Literature Assembly (CLA) of the National Council of Teachers of English (NCTE) in the USA exists to promote the centrality of literature for teaching children. Each year it publishes a list of 'Notable Children's Books' in 5 categories - poetry, historical and realistic fiction, fantasy/folklore, information books (including biography and autobiography), and picture books. The 2010 list was released recently (here). Rather than reviewing all five categories I thought that I'd focus on the poetry books. 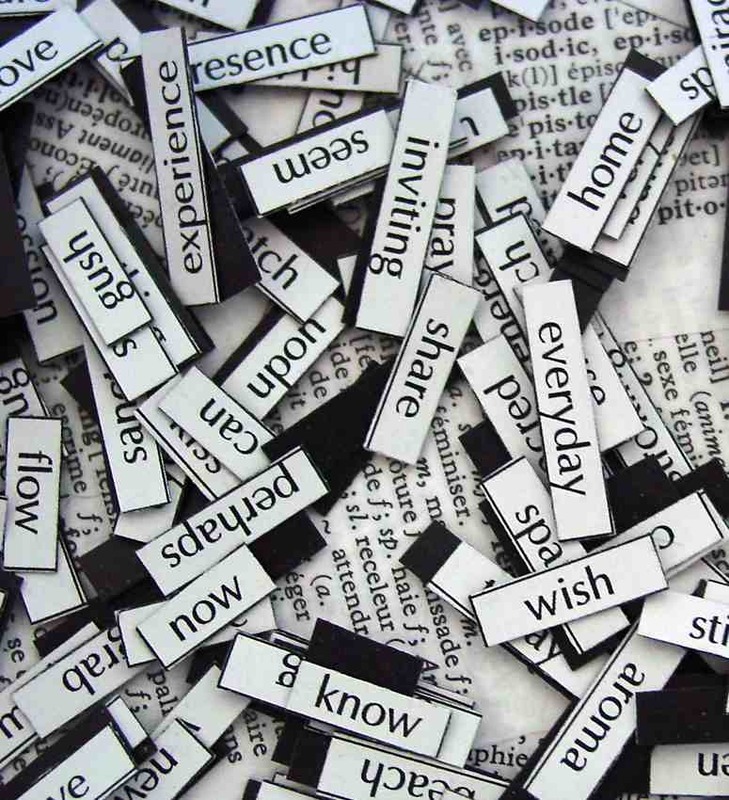 "Poetry is words and phrases that stretch our imaginations and make us dream of impossible things or unlikely worlds." No matter how we define it, poetry can be enjoyed by people of all ages; and poetry for children, if written well, can be enjoyed just as much by the 80 year old as the 8 year old. The list of notable poetry books is a wonderful collection of varied ways to draw together a collection of poems. Some are written by a single poet, others are written by many poets, one is an illustrated version of a well-known poem written almost 90 years ago and all use varied poetic forms. 1. 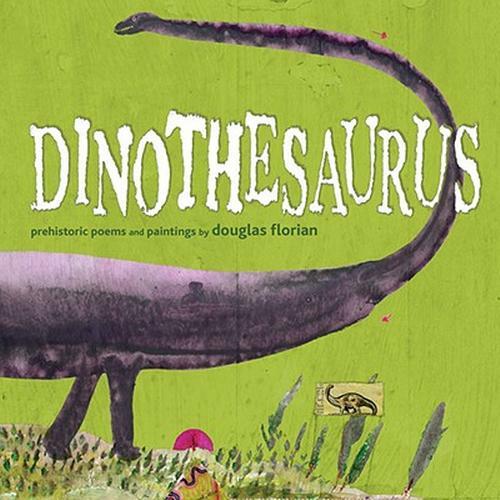 Dinothesaurus: Prehistoric Poems and Paintings (2009) by Douglas Florian. New York: Simon & Schuster. This is a collection of 20 poems about dinosaurs, including 'Tyrannosaurus Rex', 'Spinosaurus', 'Seismosaurus' and even the 'Minmi'. Now I grew up near the town of Minmi in the state of New South Wales Australia, but this dinosaur was first found near Minmi Crossing in the state of Queensland. "What's the Minmi's BIGGEST claim to fame? It has the smallest dinosaur name". Any boy (or girl for that matter) will love these poems and the beautiful illustrations that use collage, coloured pencils, dust, stamps and brown paper. 2. 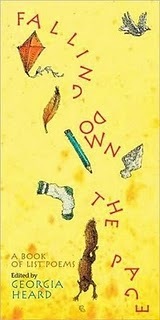 Falling Down the Page: A Book of List Poems (2009) by Georgia Heard. New York: Roaring Brook Press. This novel book consists of 32 list poems by 24 separate poets. It covers topics as diverse as the seasons, shooting stars and frogs. The book was inspired by Walt Whitman’s famous list poem, “Song of Myself”. The collection parallels the school year and the school day with poems that children will relate to whether reading them or listening to them. Here's one in the collection by Georgia Heard, the compiler of the collection. 3. 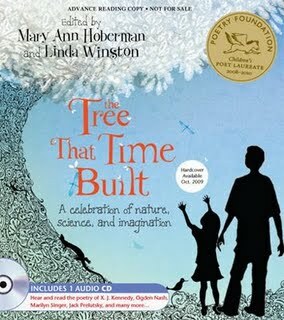 The Tree that Time Built (2009) by Mary Ann Hoberman and Linda Winston. Illustrated by Barbara Fortin. Naperville, IL: Sourcebooks. This unusual book manages to combine poetry and science. It offers a perspective from the planet's beginnings millions of years ago, through the age of dinosaurs right to the present. It uses an evolutionary cycle to tell the story of Darwin and his theories in poetic form. It was published in the bicentennial year of Darwin's birth. It contains over 100 poems and is accompanied by a CD with 44 poems read by 20 poets. 4. My People (2009) by Langston Hughes. Illustrated by Charles R. Smith, Jr. New York: Simon & Schuster. The design of the book is very effective. It consists of double-page spreads that have a black background and contain a brief segment of the poem in large letters (mostly a tan colour) and photographs. These are typically lively and sepia-toned close-up images of people. The focus is always on the faces of real people that project varied emotions (but often smiles and joy), and that complement the power of the words. Smith comments that he decided "...to show that like any other group of people, black people come in all shapes, sizes, shades, and ages, and that each of us is unique." He achieves this with great distinction! 5. 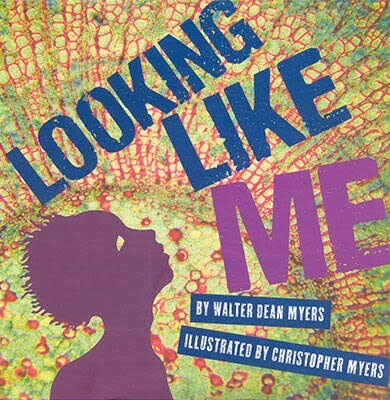 Looking Like Me (2009) by Walter Dean Myers. Illustrated by Chris Myers. New York: Egmont. This book is a celebration in poetry of people of all kinds - athletes, writers, dancers, readers, writers, talkers, dreamers, artists, brothers and sisters. Walter Myers' strong message is that we are all different and should be prepared to celebrate our diversity and uniqueness. The illustrations and words complement each other beautifully, a key quality of a great picture book. Chris Myers illustrates his father’s poetry using mixed media with vibrant colours like red, yellow and purple. Each of the people in each poem is shown in silhouette allowing the reader to more easily project themselves into each poem. 6. Sweethearts of Rhythm: The Story of the Greatest All-Girl Swing Band in the World (2009) by Marilyn Nelson. Illustrated by Jerry Pinkney. New York: Penguin. 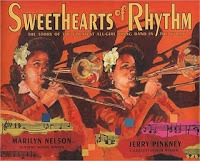 'Sweethearts of Rhythm' was the first integrated all women's band in the USA. It played swing music and was formed in the late 1930s. The singers all attended the Piney Woods Country Life School in Mississippi, which was for poor and orphaned African Americans. It was formed to raise money for the school, but it was so good that it eventually toured the whole country and played to massive crowds. The band is the focus of the book, and its story is told through a set of rhythmic poems that are written in the varied voices of the instruments. Jerry Pinkney's illustrations add further richness with brilliant collages made from textured paper, including music, maps and even flowers, which overlay sketches that use watercolour, coloured pencil and graphite. The book also includes author and illustrator notes, a bibliography, and a list of related films, recordings and websites. 7. A Whiff of Pine, a Hint of Skunk: A Forest of Poems (2009) by Deborah Ruddell. Illustrated by Joan Rankin. New York: Simon & Schuster. 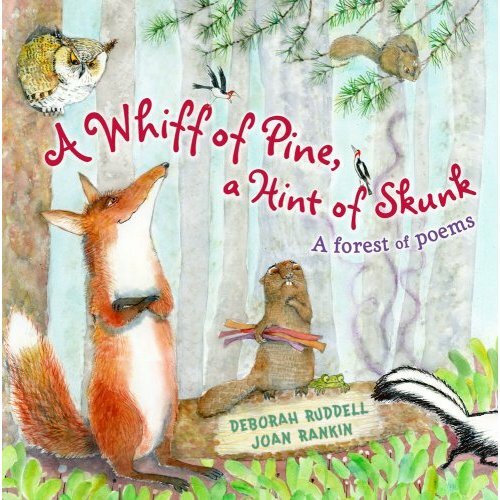 This collection of 22 poems about forest animals written by Deborah Ruddell and illustrated by Joan Rankin will be a winner with younger readers. Ruddell's poetry focuses on the lives of rich animal characters that do many things. There is a poem that compares coyotes to carol singers, one in which a badger is writing a love poem, and there is a toad that tells of its ruined lunch. and now I feel sick." The book is well designed, using a large bold font for the words and beautiful integration of text and image. Ruddell's poems are a riot of word play that are enriched by Rankin's magical watercolour illustrations. Children will love reading it or listening to others read them. 8. 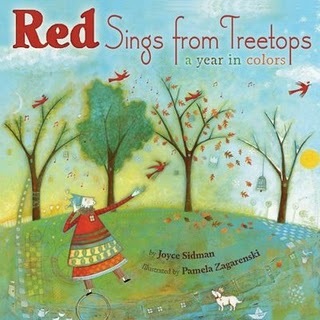 Red Sings from Treetops: A year of Colors (2009) by Joyce Sidman. Illustrated by Pamela Zagarenski. New York: Houghton Mifflin. 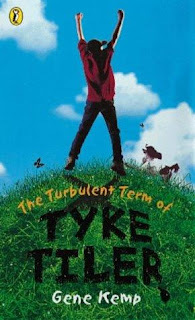 As well as appearing now on the CLA notable list, this book of poetry was named earlier in the year as one of the 2010 Caldecott Honour books. Zagarenski’s playful illustrations support and enrich Sidman’s wonderful poetry as she explores the seasons and their colours. This book is a wonderful blend of exquisite wordsmithing and stunning illustrations. Many teachers and parents neglect poetry, here is an opportunity to seek out some of the best that have been published in recent times. You can see a list of all my posts on children's literature HERE. I'm not too keen on the invention of new forms of 'literacy', because it always seems to devalue or break down the significance of the term 'literacy' as applied originally to reading, writing and understanding written text. We have a proliferation of terms that incorporate 'literacy' including 'financial literacy', 'musical literacy', 'multimedia literacy', 'driver literacy', 'environmental literacy' and 'computer literacy'. But of all the possible new forms of literacy we have seen, surely 'visual literacy' has some legitimacy. What do I mean by the term Visual Literacy? My definition is simple - The application of our visual senses to understand, create and use images for varied purposes. By images I mean pictures, photographs, created objects (e.g. 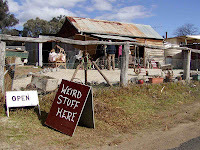 sculptures, architecture etc), advertisements, art, signs etc. These may incorporate words, but the dominant sign system that is used is the image (whether in space, on screen or on paper), not the word. The photograph on the left of Indigenous Totems in British Columbia I would classify as an image whether represented in a photograph or when observed in situ (although interpretation is altered when viewed in their full context). 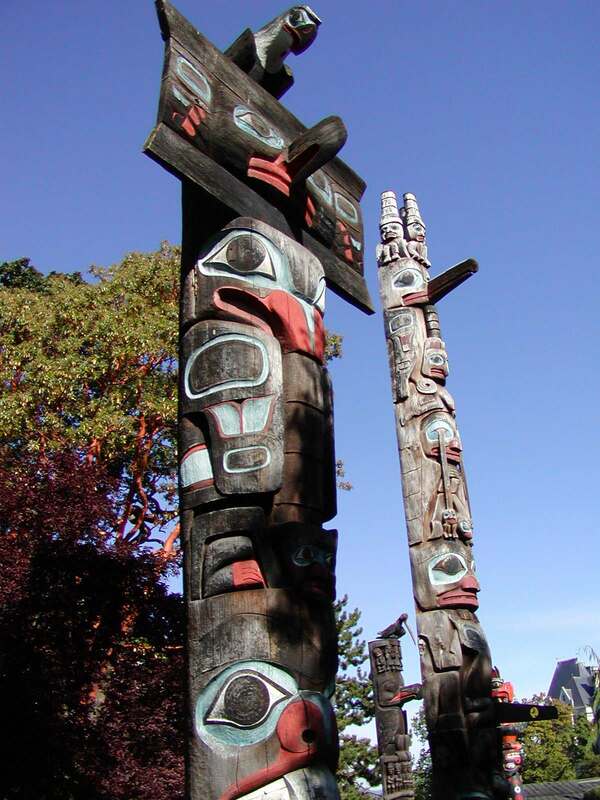 Understanding what the totems might mean and their purpose, requires visual literacy skills as well as some background knowledge used in concert with visual skills. This will include historical knowledge of the varied forms of totems, their purposes, common images used and so on, and information on their location and the people group that created them. power to inform and persuade. Children and adults need to understand images and have well developed visual literacy skills to learn from them and to communicate with other people. In particular, children are increasingly subject to the use of images to persuade them to buy things, value things, imagine their futures, and understand the present and the past. This has positive and negative consequences. Critical social theory - this considers how art and media are used to empower and disempower people. Cultural studies - this looks at how images are implicated in the social and political concerns of the day (e.g. racism, gender equity etc). Media studies - this approach uses art history and literary criticism to consider how the image is used to communicate. Quantitative approaches - these use a form of content analysis to analyse the topics or content privileged in newspapers, advertising etc to detect bias and intent. 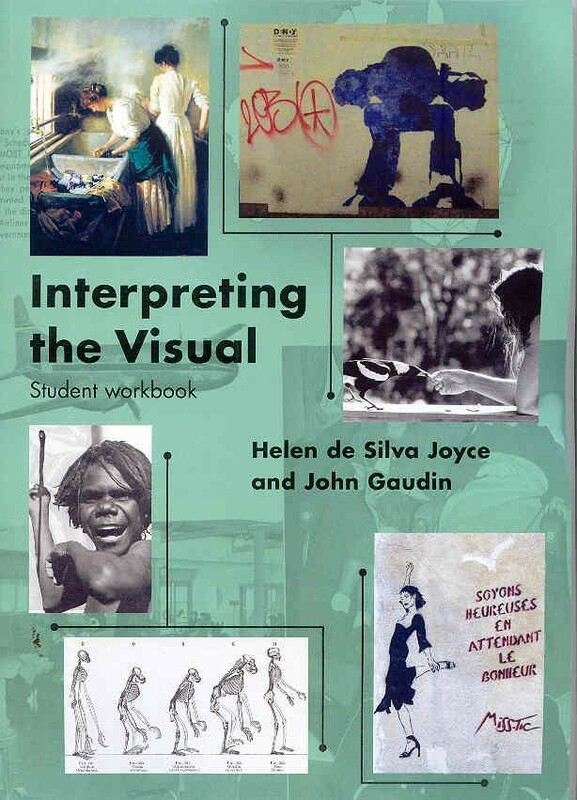 'Visual literacy' is essentially an educational rather than a research tool. It seeks to offer children the tools that they need to understand the many visual images they meet each day. 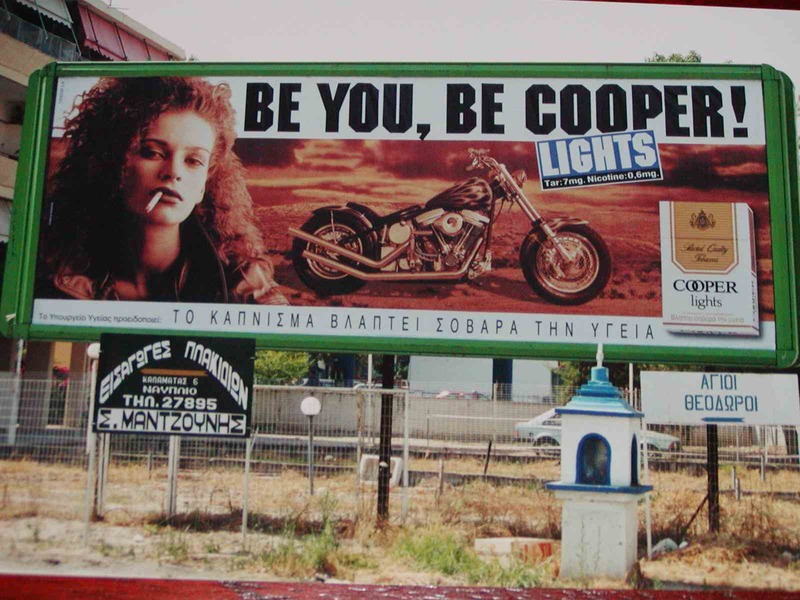 These are the skills that will allow them to understand why I took the photograph below of a roadside sign in Athens. What is the content? How have I used juxtaposition? Why have I done this? What am I seeking to communicate? More on this later. Today there is the added necessity of helping children to interpret images to determine not just their intent but whether they represent truth or a distortion of it. My post on 'Truth and the internet' explored the inability of children to interpret a story about the 'Pacific Northwest Tree Octopus'. Images are used to inform, warn, amuse and so on, but they can also be used to manipulate, distort, coerce and mislead. Visual literacy skills help children to understand the purpose and meaning of images. 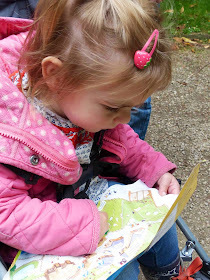 How can we help our children to be more visually literate? 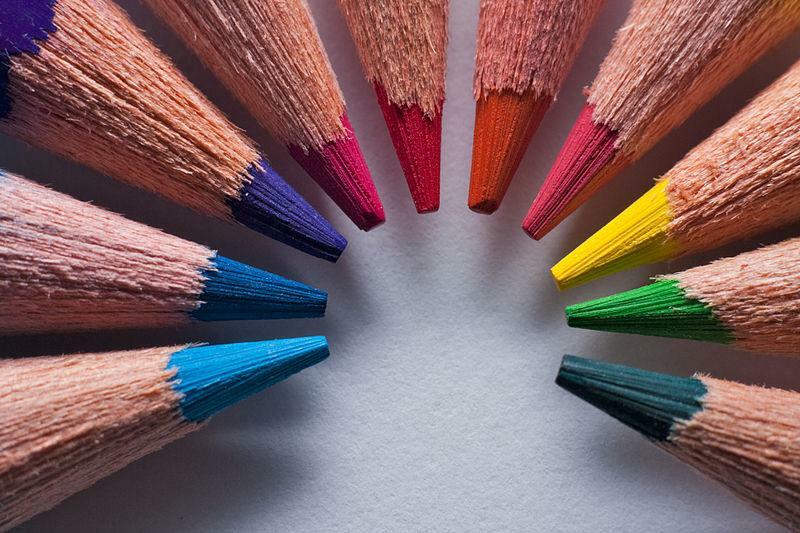 There have been a number of frameworks suggested for teaching visual literacy skills. One of the earliest was developed by Kress and van Leeuwen in 'Reading Images: Grammar of Visual Design' (1996). They suggested that any form or communication simultaneously fulfils three functions. I have inserted some questions below based on generic questions derived from Kress and Leeuwen to help make plain what each of these are. I have based the questions on the above 'Be You, Be Cooper' image. Representational - Any image conveys meaning and some view of the real world. What type of image is it? How was it created? Where might the image be situated (where is it from)? When do you think it was taken? Interpersonal - Images aim to engage the viewer in some way. Why might the person have taken the photo? How do the parts of the image relate to one another? What is the relationship between the people and the things in the image? What makes you want to look at this image? How does it make you feel, or what emotions does it lead to? What is the image-maker trying to say? Composition - Images are made up of elements that are arranged or reproduced in a particular way to achieve an intended effect. How are the elements in the image arranged to make their point? How are the elements arranged to make you look at certain things? Why are some elements in the image given less prominence and others more? Why has it been created and how does it work on us? How has the image been constructed to achieve the above? Even an image as simple as my photograph above has much to discuss. I took it in Greece in 2002. The image was taken because I was struck by the juxtaposition of the sign promoting smoking, a practice that increases your chances of dying from cancer, a car, and the small white shrine below the billboard. 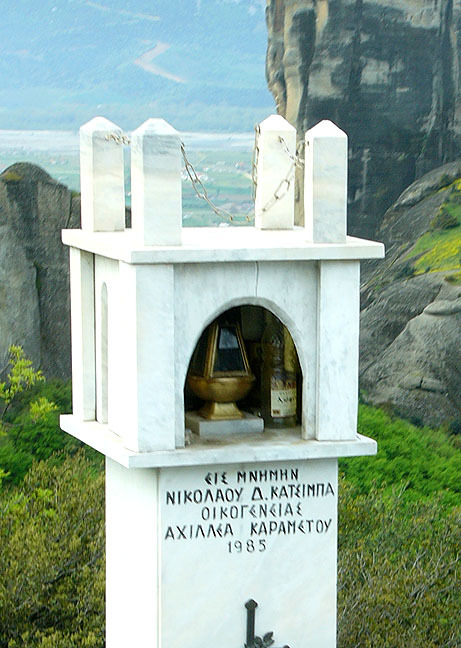 The small shrine is typical of thousands erected all over Greece at the site of car accidents. In a nation where smoking is very prevalent and it has one of the worst road tolls in Europe, I was stopped in my tracks. The alignment of the white car, a potential cause of death, the cigarettes, another common cause of death (and a habit being glamorised), and the shrine that commemorates the sadness of death or thankfulness for a near miss, spoke very powerfully to me. I had to take the photo. As with the interpretation of any image, if children were to consider this photograph they may need help. Simply applying the above three-step framework will demonstrate how. What? If children were to consider this photograph they may need help to identify the shrine as an element but the others are self-evident. 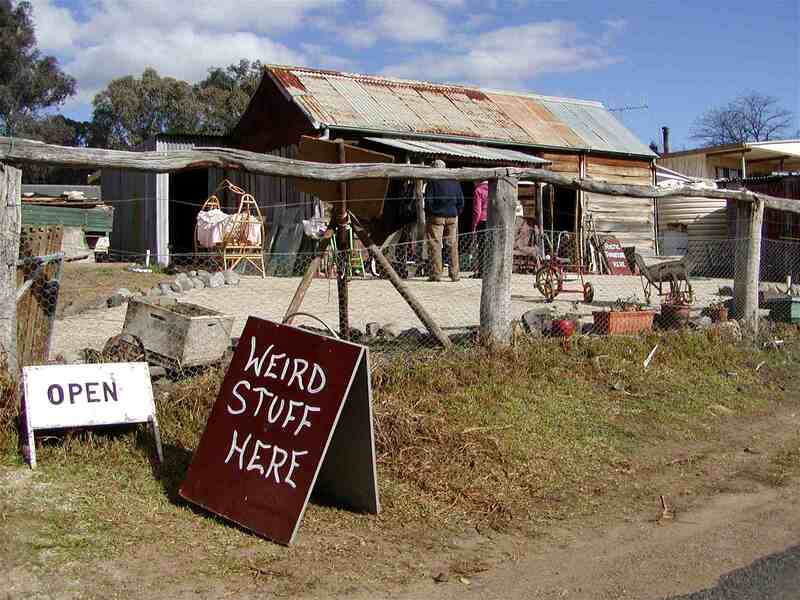 They might also need help to identify the foreign language on the sign (the clue to location). Why? Once the children know the elements they are part way to understanding why I took the photo. They will need some knowledge. You could tell them about the purpose of the shrines, or you could offer a web link for them to explore. How? Once the 'what' and 'why' are known even many younger primary school children will be able to look at my purpose as a photographer and how I achieved it is pretty straight forward with this image. I’ve written before on the importance of reading to and with your children (here). However, I’ve been asked a number of times for help with more substantial books to read aloud to children as they grow in language and reading proficiency. 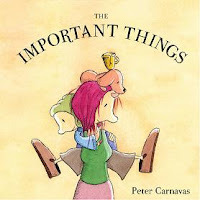 In this post I suggest some good chapter books for children aged 5-7 years (boys and girls). Is my child ready for chapter books? In one sense, this is an easy question to answer. If he or she won’t sit still long enough to hear a chapter through, then it’s too early. 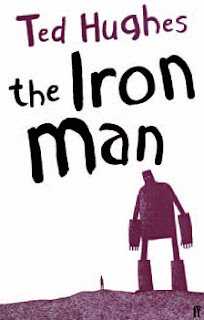 But, then again, you might just be choosing dull books or books that are just too hard and complex as narratives. You might also need to sharpen up your story reading. 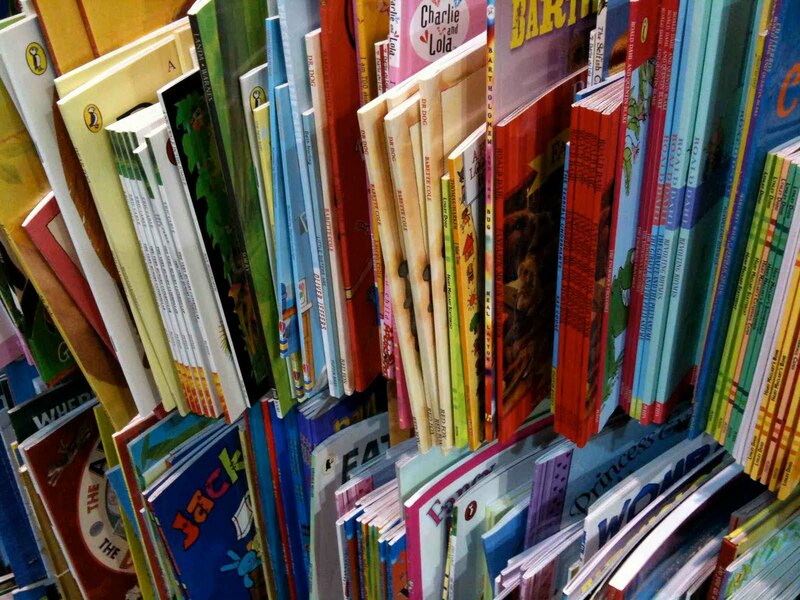 Can your son or daughter listen for 30 minutes plus of reading aloud from picture books? 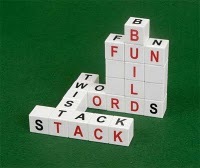 In a post I wrote in 2008 on ‘Guiding children’s learning’ (here) I talked a little about Jerome Bruner’s concept of “scaffolding”. This idea was devised by Bruner to explain the behaviour of adults helping three and five year old children. He identified scaffolding as a process where an adult helps children to learn in advance of their developmental level. The adult does this by doing what the child cannot do by themselves; allowing students to slowly take over parts of the process as they are able to do so. In many ways, this is the most fundamental reason to read chapter books to your children once they have become avid listeners to stories and beginning readers. They can listen to more complex stories than they can read themselves as emerging readers. The list below is not meant to be extensive, just illustrative. It has a particular Australian flavour (but not entirely). I preface the following suggestions by saying that individual children will handle these books at different ages. The age guide that I have given is meant to be a ‘group age’ guide for teachers sharing such books with larger groups. Parents reading to a single child will perhaps find that their child can deal with books I’ve listed at an earlier stage. Conversely, your child might not be ready for some of these books as suggested. You may also find that they can handle even more difficult books not on the list (but don’t forget the warnings above). 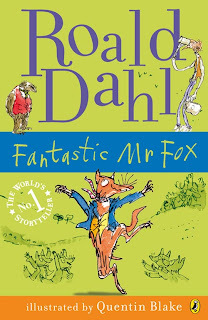 Because there are so many wonderful books being published all the time I thought I might do a regular review of recently released children's books that I think are worth reading. 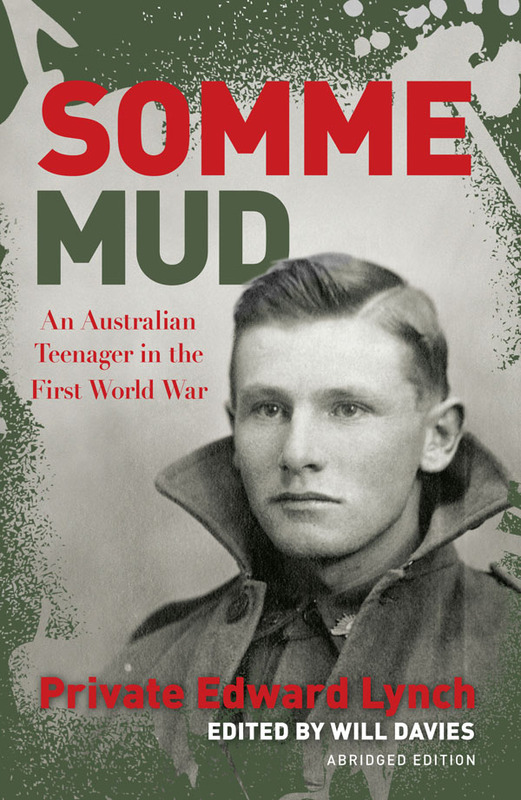 They will usually be Australian books available from good bookshops at the time I write the post. 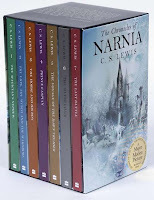 They will generally be available in the USA and the UK as well, even if only online, but overseas readers of this blog may sometimes have to wait a month or so after the post to see the books on sale through major online stores. Each issue will be broken into four sections, 'Picture books', 'Junior fiction', 'Independent Readers' and 'Non-fiction'. I'll generally choose 1 or 2 books in each category. Kylie Dunstan won the Children's Book Council of Australia Award for Picture Book of the Year in 2009 for her brilliant book 'Collecting Colour'. 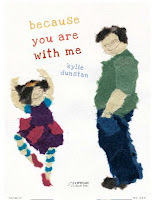 Her latest picture book tells the story of a special relationship between a father and his daughter. The little girl can do anything as long as her Dad is there. She can walk down a dark hallway when she knows her Dad is there, she can even look a tiger in the eye if her Dad holds her hand. The predictable text and beautiful illustrations support each other perfectly. Dunstan uses collage made from Nepalese lokta paper with great effect. She is a very talented author and illustrator. This story tells of the special bond between a mother and her son Christopher that grows stronger as they struggle to cope with the loss of their husband and father. Both mother and son try to cope in different ways, but eventually face up to each other's feelings and work together to deal with their loss and live a new life together. The story shows the importance of remembering, shared bonds that strengthen relationships and the joy of a special relationship between a mother and a son. Billie B. is an independent young woman who stands up for what she believes in, sticks up for her friends and has her own special 'style'. Billie has many adventures. In the first book in the series 'Billie B. Brown: The Bad Butterfly' the central character wants to be a famous ballerina, but perhaps not in the role she has been given; perhaps a swap of roles to something more suitable will help? Other titles include 'The Soccer Star', 'The Midnight Feast' and 'The Second-best Friend'. The short 44-page format and simple texts make this suitable for younger readers. Younger girls (aged 6-9) should love them. It's school summer holidays and 14 year old Katie Crisp has time on her hands after another unspectacular term as far as grades go. But she has talents as yet undiscovered. When she discovers that a well-known family soft drink company (Parfitt's) is being taken over by a major corporation that will leave her mother unemployed, she decides that it's time to use some hidden talent. With some friends, pocket money and lots of creativity, she sets out to save the company and her Mum's job. This book that tells the story of how the book 'My Place' by Nadia Wheatley Donna Rawlins (see my previous post here), was turned into the television series of the same name (here). This recently aired on Australian television. 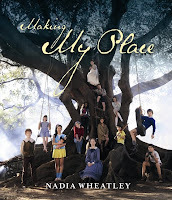 Wheatley explains the evolution of the series from the book and takes the readers through all stages of the film making, including script writing, casting and direction, costumes and make-up and then offers an analysis of the plot and characters. There is also a set of free teachers' notes available (here). Spelling like writing has often been surrounded by many misconceptions concerning how it is developed. This is an area of the school curriculum that has been misunderstood by children, parents and even some teachers. The standard way to teach spelling in schools has generally been through the memorisation of lists of words and learning rules. But as I pointed out the last time I did a post on spelling (here), it is impossible to learn the number of words that we use as adults by memorising lists. 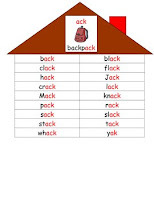 So, while spelling lists might help children to memorise some words, proficient spelling requires the development of a range of generic skills that are necessary for effective spelling. I outlined these 10 key skills in the previous post (here). Most children learn quite naturally to experiment with writing and spelling, and adults support this at a very early age. Even as we read to toddlers we point to words and language devices; this in a sense is the beginning of spelling awareness (not just reading). 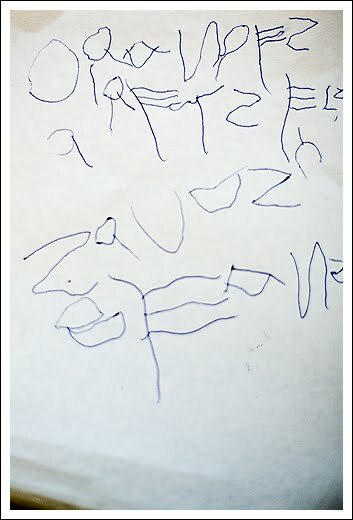 Early memorising of rhymes and songs, playing with sounds and words play of all kinds is also the beginning of spelling. The 10 necessary skills outlined in my previous post (here) are acquired both incidentally ('caught') and by explicit help ('taught') and instruction. There are a variety of more explicit strategies that teachers and parents can use to support spelling development in the primary school years. I will share 8 key strategies that many people find helpful (some of which I shared in my last post).